SILICON SLOPES, UT--(Marketwired - Nov 5, 2013) - InsideSales.com, the global leader in cloud-based sales acceleration technologies and solutions, conducted research revealing that inside sales is growing 300 percent faster than outside sales, with 42,400 non-retail inside sales jobs being created per year. "A new sales model is emerging. It's not an evolution, it's a revolution," InsideSales.com CEO and Founder David Elkington said. "Organizations like ADP, IBM, HP and Google are shifting resources from expensive field sales models and deploying massive inside sales departments. This shows that the inside sales industry is ready to explode." "Inside sales is fast, cost-effective and tailored to the needs of today's hyper-educated buyers. Travel expenses are minimized, and inside sales reps are achieving a higher percentage of quota than outside sales reps," InsideSales.com President and Founder Ken Krogue said. "Inside sales also offers buyers increased flexibility. They can watch a half-hour demo from their own office rather than setting aside half a day to meet with a salesperson." "Today's customers want immediate, succinct, relevant and experienced interactions at all points of the sales cycle, from prospecting through the close. Traditional face-to-face misses out on the immediate and succinct piece. It no longer has the advantage over a virtual exchange," American Association of Inside Sales Professionals (AA-ISP) Founder Bob Perkins said. "These skills and attributes are exactly what inside sales has proven to do so well over the years. It's exactly why corporations of all sizes are realizing and leveraging the power of inside sales. It's why our profession is exploding in terms of both job growth and revenue responsibility." InsideSales.com foresaw the inside sales revolution during the inception of the industry and created technologies and solutions to make inside sales reps more effective. Customers experience improved contact rates by up to 65 percent, increased call volumes up to 8 times, enhanced sales productivity analysis and reporting and boosted sales team motivation. InsideSales.com cutting-edge technology accelerates sales with science. The global leader in cloud-based sales acceleration for sales professionals provides the industry's only comprehensive sales acceleration platform, which includes communications, gamification, predictive analytics and data visualization. The American Association of Inside Sales Professionals (AA-ISP) recognized InsideSales.com as the SaaS provider of the year for 2013. The company has been listed among the fastest growing companies by Inc. and Deloitte and as one of the top 100 private companies by AlwaysOn. InsideSales.com also ranks No. 5 in the nation for jobs created in the software industry and No. 72 in the nation for jobs created in all industries by Inc. InsideSales.com leading research has been published in the Harvard Business Review and Forbes. The company has been issued 5 U.S. patents and has 11 patents pending. InsideSale s.com enterprise customers include ADP, Dell, Gannett Local, Inc., Marketo, Re/Max Cornerstone, Microsoft, Groupon and more. To try the technology, visit InsideSales.com. 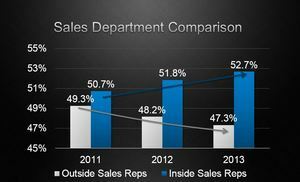 Inside sales is surpassing outside sales. See how InsideSales.com accelerates sales through science.